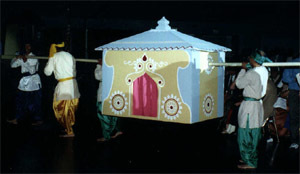 Manick Sorcar was invited by the 19th North American Bengali Conference committee to help them design a stage with the state-of-the-art lighting and create and direct a 'Grand Opening Ceremony' that will be totally unique. And that's exactly what Sorcar delivered. Denver-based Manick Sorcar took time out of his busy schedule and made at least two trips per month since February to San Francisco to create a five-stage performing arena that is not only the first of its kind in NABC history, but also in USA. 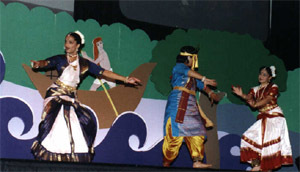 A full size 40-ft stage was connected to two smaller stages on each side, with unique two and three dimensional stage settings, stylized art work, intriguing lighting - altogether representing a most artistic yet typical village scene meeting the NABC-99 theme 'Sonar Bengal' or the Golden Bengal. 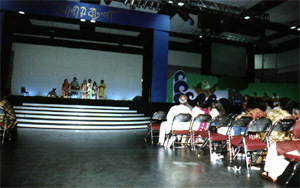 The stage settings with complex props, state-of-art lighting with computer-operated Cyberscope-laser-ellipsoidals, and corresponding stereophonic sound were specifically designed to give a most unique effect to the "Grand Opening Ceremony", also directed by Sorcar. 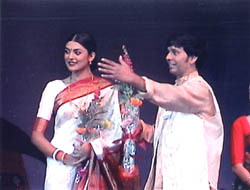 Former Miss Universe Sushmita Sen acted as the Bengali Lady to light the evening lamp followed by a sequence dances with corresponding popular songs which enhanced the show. 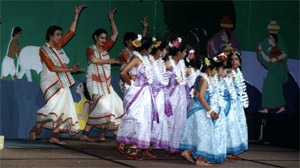 A total of 70 performers took part in the most unique show which was liked by all. "After a series of mercifully brief speeches, however, the organizers redeemed themselves dramatically with what must be ONE OF THE MOST SPECTACULAR INAUGURAL EVENTS IN ANY INDIAN MEET. 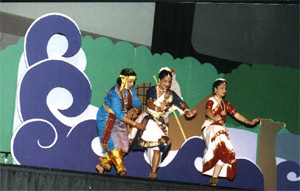 On a five-level stage, sets of dancers took turns performing in each level to music which was so well sung and orchestrated that it was hard to believe it was done by Bay Area artists - but it was. with one doing the hair of the other, a boatman, tall palms, a billowing paddy field, even two huts on two sides. 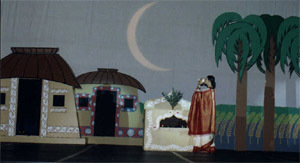 Instead of a standard 40 ft stage, all of this was set in a huge 120 ft. five level stage that was quite a spectacle. "Since childhood, I used to help my father in magic," Sorcar, who is the son of magician P.C. Sorcar, told India-West. 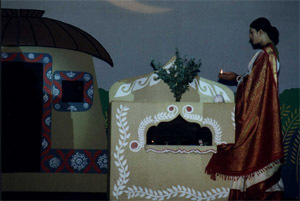 "I used to help in lighting. I became an engineer but I could not forget my art." 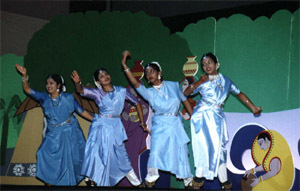 The conference also featured a Manick Sorcar Animation Festival . Sorcar was honored for his "Untiring and Enthusiastic Efforts To Promote the Bengali Culture in North America"